Is resource management more than a business term? Do you take that? Or would you rather use worker placement to gain area control? We dissect some common terms from the board game world, and give examples of games that use these mechanics. Senshi by Arcane Wonders – recommended to us by Ryan and Erin Gutowski of One Board Family, Andrew received this abstract game for his birthday. It’s simple to play; the depth of strategy is driven by the way the scoring works. A great game to travel with, you could easily play it on an airplane tray table. Poetry Slam by Mayday Games – we were pleasantly surprised at the depth to this party word game. Come up with a word that follows the randomly-generated restriction. Then come up with a rhyming couplet (2-line rhyme) that is a clue to allow other players to guess your word. Also award “snaps” (beatnik style) to fellow poets for well-crafted rhymes. Not great for younger kids, due to time pressure and vocabulary requirements. 10 Essentials by Trailside Games & Education Outdoors – learn about the hazards and beauties of the wilderness. A simple take-that game reminiscent of Mille Bornes. However, it is possible to continue to advance even with an active hazard, at a slower pace. Above and Below by Red Raven Games – by popular demand! Andrew could see the same DNA as other Red Raven games. Build your town, recruit townspeople, and explore the caves. The highlight is the encounters in the caves, using an encounter book to create meaningful choices. We will talk more about Above and Below as part of next week’s interview show. We’ll have a ton of games to talk about for episode 114, because Boston FIG is this weekend! If you’re in central New England, you should go to MIT on Saturday (September 29) for the festival. If you see us, ask us for a button! 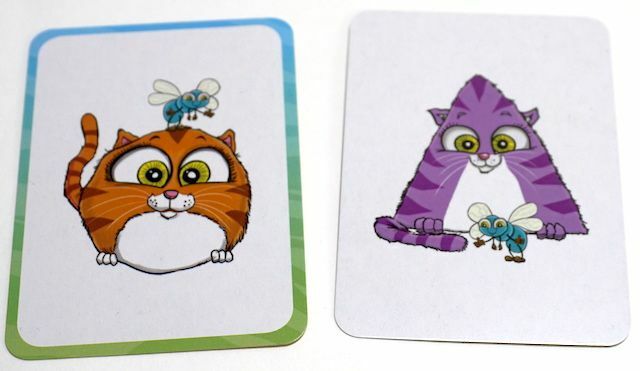 Read the transcript for Anitra and Claire’s review of Super Kitty Bug Slap. Most of the player interaction is through directly attacking each other, either reducing points/level/etc. or impeding their progress. Obviously, take-that games have a heavy emphasis on conflict. Some kids love them and some hate them, these games tend to feel very unbalanced when you are the only adult playing against children. Most rely heavily on luck (but not all! Andrew suggests Illuminati as an example that has very little luck). Take-that provides player interaction in games that would otherwise feel pretty solitary. Examples: Mille Bornes (impeding progress), Munchkin, and included in smaller doses in games like The Mansky Caper or The Grimm Forest. Any game where points are awarded to the player with the majority of units/influence in a given area. Examples: Risk, Twilight Struggle, Smallworld, Carcassone, New York 1901, World’s Fair 1893 (not a literal map area, instead areas of influence). Andrew’s favorite mechanic. Place a worker, get to do a specific action. Usually means that no one else can do that action until workers are “returned”. Often combined with resource management. Examples: Lords of Waterdeep, Tzolk’in, Dice Forge (for heroic feats), Imhotep, also Agricola, Caverna, Stone Age. Tokaido is an interesting twist on worker placement with a different set of restrictions. My First Stone Age is *almost* a worker placement game, but players have to use their memory to flip over the correct tile to move their worker. Any game that is about collecting resources or moving them from one place to another, usually with incomplete information. Core component to many modern board games. Did we miss your favorite game for one of these categories? Let us know! And don’t forget about our giveaway from Grand Gamers Guild. PLEASE tell your friends about the show or leave us a review at Apple Podcast or whatever your podcast subscription source is. We’re now on TuneIn.com!